Generally we criticise Indian bureaucracy for its incompetence and corruption. Both became so deep rooted in popular mind that, we often overlook some brilliant job they are doing. Creating, deploying, running and dismantling world's biggest metropolis is undoubtedly one of them. Let's take a look at the statistics. Kumbamela - celebrated at the intersection of Ganga (Ganges), Yamuna and mythical Saraswati – is billed as the biggest human congregation anywhere in the world. 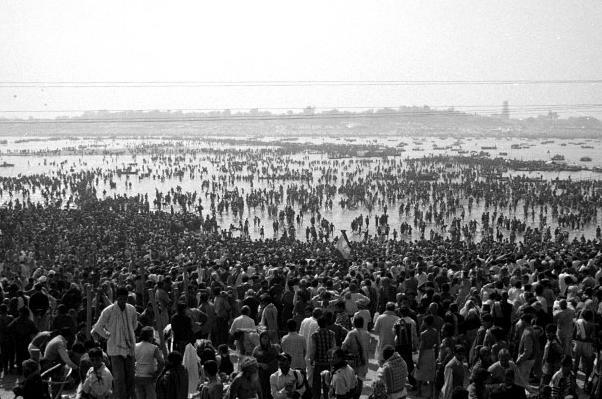 On the banks of Sangam at Prayag (Allahabad), this human ocean temporarily creates a metropolis, roughly three times that of Tokyo metropolis. Let's take some figures available from this year’s (2013) Kumbmela. 1. This temporary city spread over 8 sq. miles on the riverbed. 2. Twenty eight departments of state government are involved in providing security, running water, an electricity grid, transport infrastructure, health care, sanitation, food rations and bathing areas. 4. Temporary barrel bridges stretch over a half-mile of water and can carry a load of 5½ tons at a time. Each takes 250 men around 25 days to put in place. 5. Temporary electricity grid with 100,000 connection points, 45 diesel generators, 52 substations and 22,000 posts carrying 2,081 miles of cable. 6. Temporary road surfaces...using 99 miles of double steel plating...Some 25,000 street lamps...site, which totals 22 square miles. 8. 250 doctors and 400 paramedics in the 15 field hospitals...14,000 police officers on patrol...30 on-site fire crews.